My first finished quilt of 2014 was requested my one of my best friends, who is about to become an aunt any day now. This quilt is for her to give to her new niece or nephew, and today is her birthday! I was struggling to find a name for it until I thought of the stripes as friends like me and Amy. They are besties, similar but different, there for each other. Separated by a small distance. This quilt is going to live in Manhattan, so I wanted something that was both playful and sophisticated. It measures 42″ by 48″, so it’s a good crib size for a baby. 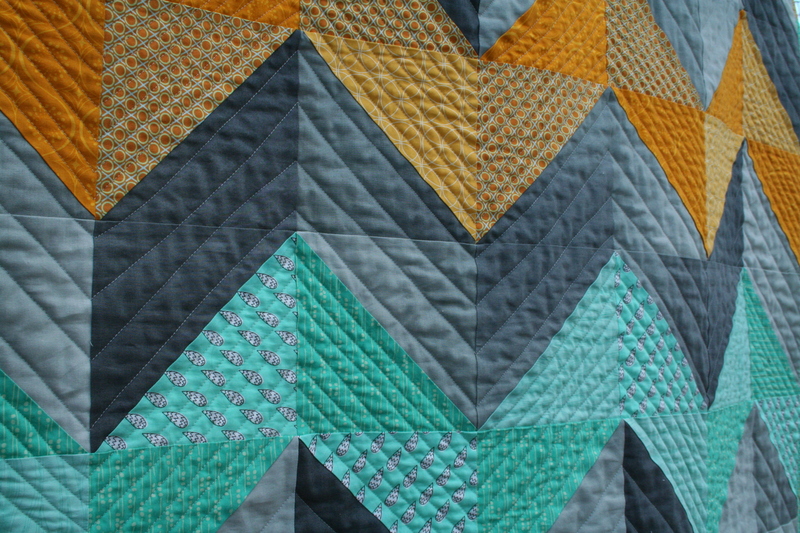 The quilting is echo zigzags about an inch apart. I made the lines more dense inside the chevrons. The back is a cotton/linen blend that gives it a nice weight and will only get softer with each wash. 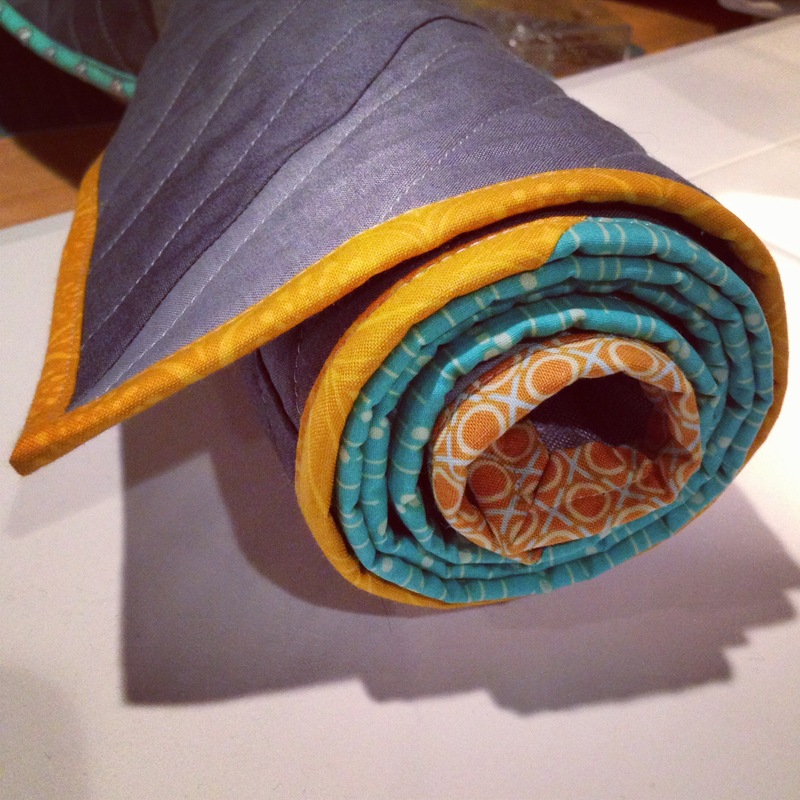 The design is inspired by Elizabeth Hartman’s Roller Rink quilt, but it’s a LOT bigger than the pattern in Modern Patchwork. I used the gray ombre fabric from Simply Color by V and Co. The color prints are from my stash and include Comma, Anna Maria Horner, Thomas Knauer, Monsterz from Cloud 9 and Reminisce. 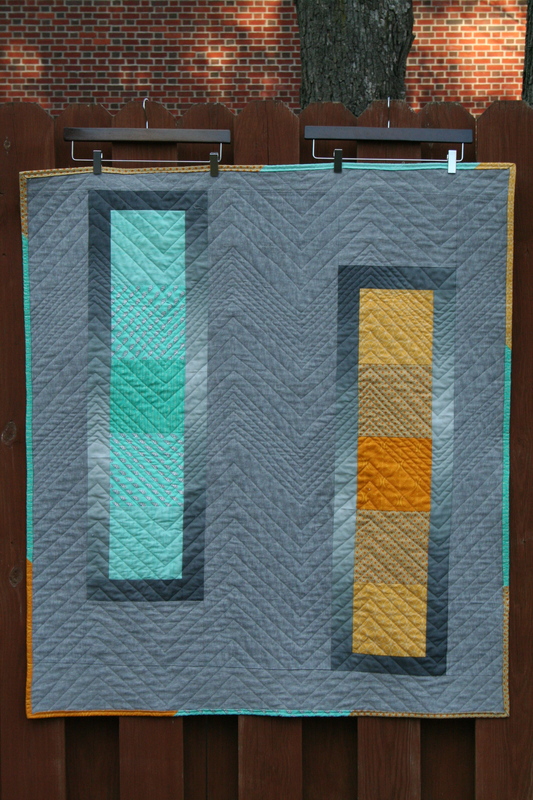 Golden yellows and teals are my favorite quilting colors, and not only do they look good together, they also work for both boys and girls. I love how the ombre can add depth to something as simple as half-square triangles and make it look like the rectangles on the back are shining in the sun. I didn’t realize until the quilt was almost done that this was my first time doing a scrappy binding. I think it brings just enough color to avoid being too gray and dull. 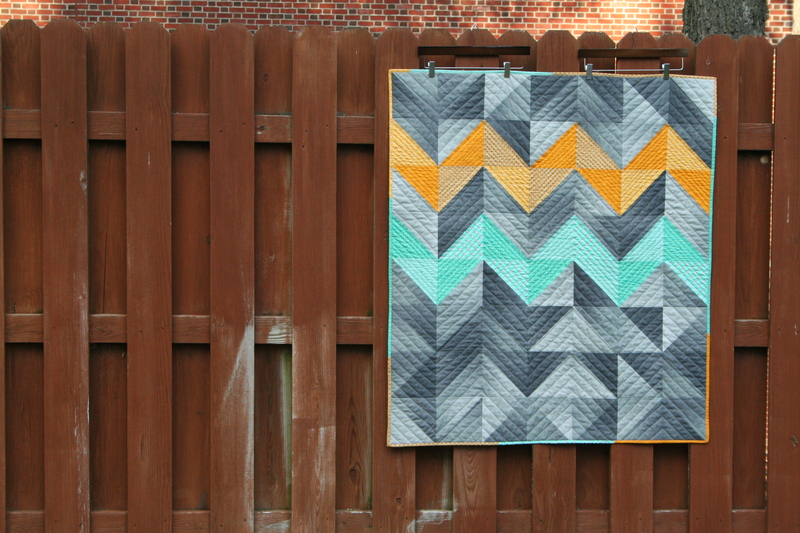 This quilt was fun and fast, and I can’t wait to see if it will go to a little boy or a little girl. And happy birthday to my own BGFF (I married my best friend, obviously), probably the wisest, most curious and passionate woman I know. It’s lovely. 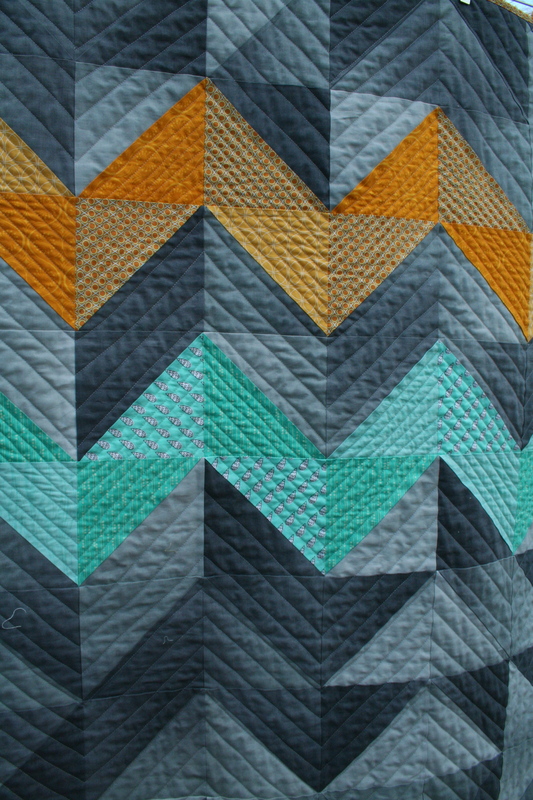 I love the dimension you get from the different greys, and the aqua and yellow really make it pop. That’s a very sophisticated baby quilt! That’s how I like ’em! Thanks, Kate. LOVE-LOVE-LOVE! Colors are perfect. Since I Love it so much I will let you know when I make its twin! Keeping my fingers crossed since I need to finish quilting everyone else’s quilts. It is a beauty! Thanks Helen! I love when people make things I’ve made too– definitely let me know! Was out and about today–couldn’t find any black gray ombre—so I have resorted to dyeing my own. Somehow I am making this a mission thing! Don’t know weather to Thank You or not for your beautiful quilt post!! I am down the Parkway in Cape May C.H. However a group of us are heading up to Quilting Inspirations, Mouse Creek and to the Jersey Shore Modern Quilt guild meeting (yes! we drive 2 hours to be Modern Groupies-call us crazy) on Wednesday. Who knows, we may just stay on the Parkway!! what is a few more miles–Right? I will check out the Esty. Although, I did come across Purple and Pink Ombre–Wahoo!! I will eventually be up your way visiting a friend (she belongs to NYMQG) that just moved from Manhattan to West New York NJ. I will mention this shop to her too. Love this!! I especially like the binding–how creative! So wishing I lived near you to take one of your classes! Happy New Year! Happy New Year! I miss seeing your lovely face. really beautiful! I especially love the mixed binding which will keep those tiny fingers busy for years to come! this is definitely my favorite thing you’ve done with the ombres – and that is saying something. it is phenomenal! I just love a good ombre! I have been collecting them and using them sparingly and this would be a lovely bigger version for me to try. Love this.